November | 2012 | Sometimes I ramble. In the midst of life’s inevitable ups and downs, through nearly two decades of our married life, we’ve had a canine constant. I will start by saying that when we first brought that fluffy, white puppy home almost nineteen years ago — an American Eskimo mix of some sort, we would later learn — and my wife declared that she would be named “Paige,” I was absolutely mortified. “But that’s a people name,” I would argue, only to discover that was exactly the point. She was a nightmare of a puppy. In just a few short months, she managed to destroy our favorite oriental rug, a lamp cord or two, a pair of my glasses, the down comforter on the bed, and in one fit of what I can only assume was inexplicable rage, she chewed every belt loop off every pair of jeans she could find in the laundry. Only my jeans. Every belt loop, every pair. She would also lose her mind if either of us had the audacity to talk on the phone and, if we tried to take her somewhere with us in the car, she’d throw up the second we’d take our foot off the brake. So, we sent her to puppy boot camp, hired an immensely odd dog whispering trainer, and worked together to calm the savage beast that would become our closest ally and confidant. Like nobody else, she would have a front row seat to our marriage and each challenge we would face. She offered overwhelming doses of love, joy, and companionship when we needed it most, whether we were cognizant of the need or not. As dog’s somehow do, she sensed every sadness or sickness and offered herself up as a therapist and healer. In some of my darkest days, she was the one thing — the constant — that helped me push through. When we brought our second dog home almost six years ago — a troubled six year-old collie rescue — it was Paige who would take on the role of trainer and mentor. The collie, timid and frightened of everything after years of abuse and neglect, wasn’t much of a quick study, but Paige persisted. 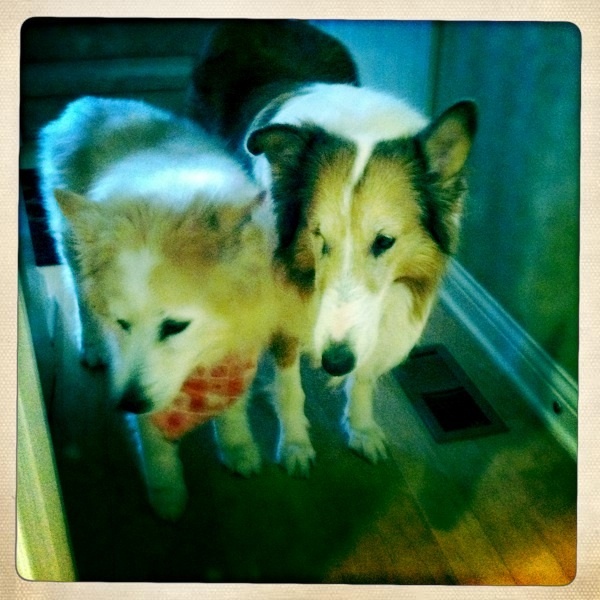 Our collie, a sweet girl named Honey, is the wonderful dog she is today because of her time with Paige. Over the years, Paige had many health issues. Her first bout of cancer, a large tumor on her leg that appeared out of nowhere, was nearly eight years ago. At the time, the veterinary oncologist warned us that the average life span of a dog her size and breed was probably only 11-13 years anyway, even in the best of health, so we should take that into consideration when deciding on a treatment plan. We went ahead with the available treatment, not just that time, but several times to follow, betting on beating the odds. Paige would continue to defy the odds for years, through several more cancer recurrences and surgeries. Sometimes I think she lived as long as she did just to thumb her nose at that vet’s ageist predictions. The last year (or maybe even two) marked a slow decline for our once fluffy puppy. Much of her beautiful coat had fallen out or broken off, she’d developed weird asthma-like breathing problems, her hearing had become far more selective, and her bladder was unpredictable at best. She was on meds for this or that, a special diet, and required frequent trips to the vet. But she always still had the spirit of a pup, managing to run and play, antagonize the collie, or bark at her long-time foe, the evil UPS man. I don’t know what the easiest way is to finally lose a much-loved dog, but I’m pretty sure we didn’t experience it. After a long night of trying to comfort her struggling, while cradling her in my arms, I felt her seize and then the life leave her body, as my wife frantically drove us to the clinic, the place where we would finally collapse in grief. We used to joke that she was going to outlive us all at the rate she was going. Of course, we knew this wouldn’t truly be the case, but it was the reality we would have preferred. She was with us for almost nineteen of our twenty year marriage, so it’s hard to imagine our lives without her. Coming home to our now smaller family is difficult, as there are reminders of her absence everywhere we look, but mostly in the confused eyes of our collie, the “sister” she left behind. The truth is, I don’t know what I believe about the afterlife, but I know that in this life, we were made into better people because of the time we had with that dog. May she rest in peace, our sweet constant companion.